(a) Remove the drain plug. (a) Install the claw to the overhaul handle, inserting it in the hole in part A as shown in the illustration. (b) While gripping the handle, adjust the stopper bolt so that dimension B is as shown in the illustration. NOTICE: If the stopper bolt is not adjusted, the claw may be damaged. 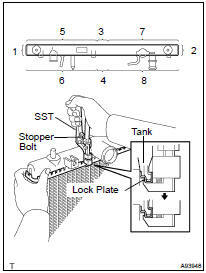 Using SST, grip the handle until stopped by the stopper bolt to uncaulk the lock plate. (a) Lightly tap the bracket of the radiator (or radiator hose inlet or outlet) with a plastic-faced hammer, and remove the tank. (a) Remove the cooler pipe (b) Loosen the 2 nuts and 2 plate washers. (c) Remove the oil cooler. (d) Remove the 2 O-rings from the oil cooler. (a) Clean the O-ring contact surfaces of the lower tank and oil cooler. (b) Install 2 new O-rings to the oil cooler. 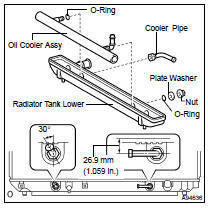 (c) Install the oil cooler to the lower tank with the 2 plate washers and nuts. Torque: 8.34 N*m (85 kgf*cm, 74 in. *lbf) (d) Install the cooler pipe in the direction indicated by the arrows in the illustration. If the sides of the lock plate groove are deformed, reassembly of the tank will be impossible. Therefore, first correct any deformation with pliers or similar object. Water leakage will result if the bottom of the lock plate groove is damaged or dented. Repair or replace if necessary. NOTICE: The radiator can only be recaulked 2 times. After the 2nd time, the radiator core must be replaced. (a) After checking that there are no foreign objects in the lock plate groove, install a new O-ring without twisting it. HINT: When cleaning the lock plate groove, lightly rub it with sandpaper without scratching it. (b) Install the tank without damaging the O-ring. (c) Tap the lock plate with a plastic-faced hammer so that there is no gap between the lock plate and the tank. (a) Install the punch assembly to the overhaul handle, inserting it in the hole in part A as shown in the illustration. (a) Lightly press SST against the lock plate in the order shown in the illustration. After repeating this a few times, fully caulk the lock plate by gripping the handle until stopped by the stopper plate. Do not tap the areas protruding around the pipes, brackets or tank ribs. The points shown in the illustration and oil cooler near here (A/T) cannot be tapped with the SST. Use pliers or similar objects and be careful not to damage the core plates. (b) Check the lock plate height (H) after completing the caulking. Plate height (H): 7.40 to 7.80 mm (0.2913 to 0.3071 in.) If not within the specified height, adjust the stopper bolt of the handle and caulk it again. (a) Install a new O-ring to the drain plug. (b) Install the drain plug. (a) Plug the inlet and outlet pipes of the radiator with SST. (b) Using a radiator cap tester, apply pressure to the radiator. Test pressure: 177 kPa (1.8 kgf/cm2, 26 psi) (c) Submerge the radiator in water. HINT: On radiators with resin tanks, there is a clearance between the tank and lock plate where a minute amount of air will remain, giving the appearance of an air leak when the radiator is submerged in water Before doing the water leak test, first swish the radiator in water until all air bubbles disappear.